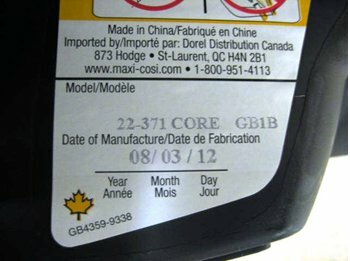 Dorel Distribution Canada in cooperation with Transport Canada is conducting a Public Notice of the Maxi-Cosi Mico Infant car seat and base, manufactured from Mar 8, 2008 to June 28, 2008. In a small number of cases it has been found that when the seat is installed onto the removable base, the seat will latch into the base, but it may not fully lock. When the seat is latched but not fully locked, the base release handle is not completely retracted. Should this situation occur the child could be injured in the event of a crash. 22371CJUC, 22371CLMD, 22371CORE, and 22371CPNG, plus a Maxi-Cosi car seat base model 22515CBLK that was sold separately. Model numbers and manufacture dates of the infant restraints are printed on a sticker on the back of the infant seat as shown below. Manufacture dates are printed in the YY/MM/DD format. Model number and manufacture date on the stand alone base can be found on a label on the top portion of the base. Consumers should visit the Dorel Juvenile Group website at to verify if their model is included in this public notice. If their model is included in this public notice the consumer should complete the online order form to obtain their free repair kit. Consumers may also call the toll-free Customer Relations number at 1 (877) 657-9546 Monday through Thursday 8 a.m. to 5 p.m., Friday from 8 a.m. to 4:30 p.m. EST.